Leading Manufacturer of cream filling machine and paste filling machine from Ahmedabad. We are engaged in offering a gamut of fine quality Paste Filling Machine to our clients. 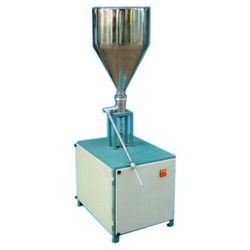 These Paste Filling Machine are offered in varied specifications and are used for packing numerous sorts of viscous materials like gel, chyawanprash, distemper, cream, balms, lotions, pastes and other products. Further, we use best available technology and our highly reliable and efficient automatic paste fillers index the containers automatically below the paste filling nozzles.